Gui.pa, an acronym for Guides to the Landscape, is a set of new conception guides created for the purpose of learning more about Italy through comprehension of its landscapes. A landscape embodies not only the natural history of an area but also the events and culture of the people who have inhabited it. Understanding the landscape, its features, the distribution of its components and their interrelations means giving a meaning to nature's forms and seeing how human endeavor has modified the natural environment; in short, understanding why a place looks the way it does today. From the conceptual standpoint, Gui.pa offers a new way of learning about the place, inspired by the methods used by people who study landscapes for professional purposes, generally outside the scopes of the average tourist. 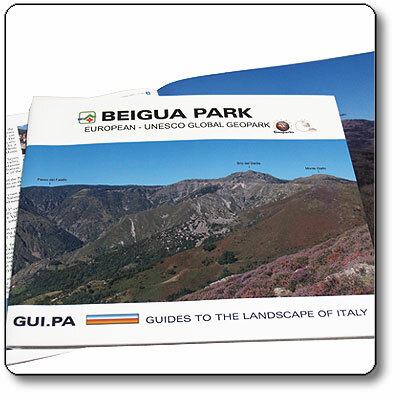 The territory of the Beigua Park is represented here by ten panoramas visible from as many observation points located along the coast and in the interior. All the Gui.pa points are situated in areas reachable on foot along roads or easy trails. For each panorama, in addition to a triple-fold 22 x 72 cm photograph, there is a text describing its territory and the natural and human events connected with it; smaller photos and a map localizing the Gui.pa point also accompany the text.